About fifteen months after I was diagnosed with Alzheimer’s, I attended a going-away party for a former colleague at the Massachusetts Municipal Association, who had taken a job as the town manager in Amherst, Massachusetts. 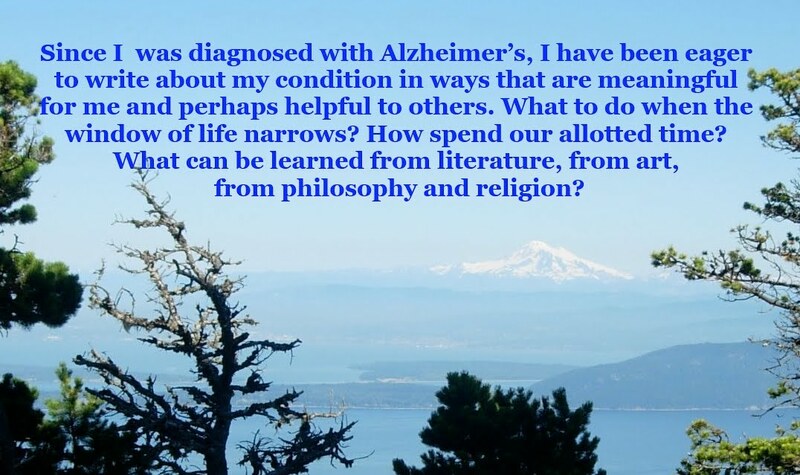 Another former colleague asked me a pointed question: “Can you still read?” I answered her immediately, noting that I was writing a weekly blog about Alzheimer’s. But her frank question made me think. It was the first such question that I had fielded. I turned around the question to ask myself, How long will I be able to read? A simple answer is elusive. In the basic sense, a Stop sign is a very important sign. So is a crosswalk. During the eighteen months I worked in the Waterbury, Connecticut, area, I reported on a gruesome neck injury. Because the authorities had failed to replace a Stop sign in a timely fashion, a man broke his neck. But more broadly, of course, I am talking about the challenges of decoding what we call reading and writing. I am drawing on two accomplished writers who don’t have much have in common: Ron Chernow, an acclaimed biographer of George Washington and other founding fathers, and Don DeLillo, best known for novels that seem to portend the near future. DeLillo’s sprawling masterpiece Underworld was published in 1997, four years ahead of 9/11. The original dust jacket seemed to portend 9/11. The twin towers still stood. An old church stood in the foreground. Of the two writers, Chernow is much more accessible. He is first a historian, but also a gifted storyteller. As I was reading this tome, I realized how little I knew about George Washington. As a young officer in the French and Indian War, he almost succumbed to dysentery. And two decades later, the scene in Valley Forge is downright horrible. Many of the soldiers didn’t have boots, and spores of blood littered the ice and snow. There are other gruesome scenes in this section. Lafayette, the French officer who led France to intervene on behalf of the colonies, ended up in a ghastly dungeon in Revolutionary France. Incredibly, he survived to meet George Washington after the war was over. At certain times I found myself skimming some portions. And that is not Chernow’s fault. Pre-Alzheimer’s, I only skimmed if I found the writer boring. First, it is a work of fiction, but not a mainstream fiction. Some of DeLillo’s novels are dark comedies, and White Noise is probably his most popular book, on account of its dark comedy. But The Names was the book that made him a prominent writer in 1982. Here is an example from the book, depicting a chaotic scene in Tehran at a time when Islamic radicals were clashing with secular protesters: “As hundreds of thousands of people marched toward the Shayyad monument, some of them wearing funeral shrouds, striking themselves, with steel bars and knife affixed, David was hosting a Chain Day party at his house in North Tehran, an area sealed off by troopers and tank barricades. The partygoers could hear the chanting mobs here but whether they were chanting ‘Death to the Shah’ or ‘God is great,’ and whether it mattered. ... The drivers were in free form.” And then kicker: They did not reduce speed when driving in reverse. “There won’t be a murder. No one gets hurt. At the end, they raise their arms, holding up the weapons.” One character is an experimental Western film director. But the original question stills hovers over me: How long will I be able to read the printed page? And I do mean “print.” Reading a book on a screen would further drop my reading comprehension. Before I bought a copy of The Names from my local bookstore, I had started reading an old copy of the novel from a library. These days, I often mark up my books quite a lot. It’s the only way to keep my focus when I am reading. But I try to be nice to my paperbacks. Sometimes, they’re in a poor condition, and I always refrain from using ink. Mechanical pencils are a better option. About a year ago after I arrived in Waterbury, Connecticut, I covered my first murder story. It was literally “a dark and stormy night.” I did not work in the main office. I shared a bureau with another reporter, about a ten-mile drive from Waterbury. My bureau partner was covering something much more pedestrian, almost certainly some tedious meeting that would go on for some time. I was in touch by phone, of course, with my editor in Waterbury. Then lightning struck, and our bureau lost power. Moments later, I got a phone call from Chuck Dixon, my editor. Chuck was a throwback. It didn’t seem that he got much exercise. He drank quite a lot, favoring the hard stuff. He liked to play poker. And he was a good storyteller. He wore a trench coat, and soon I went out and bought a trench coat for myself. But this particular story almost ended up as a debacle for me. When I reached Chuck by phone, he was livid. Rather than writing down my story with ink and paper, and dictate to Chuck in the main newsroom, I had decided to write my story on my computer screen, which I had never done before. What was I thinking? Where was the rest of my story? Had it vanished into the ether? I was horrified. And keep in mind, this was a murder investigation. Thousands of subscribers would be reading my story the next morning. Or would they? In 1985, computers were still unreliable things. The notes I had typed into my screen had vanished when my office lost electricity. I felt ill.
Fast forward to the present. Most computers remain delicate—exceedingly so. Just spilling a few ounces of water can be dire, as I did recently. And what was at stake? Oh, not much. Just a book about Alzheimer’s that I had been working on for the past three years. This isn’t a hulking tome. But it distills the knowledge I accumulated over those three years since I was diagnosed with Alzheimer’s. And as my fellow local writer Leslie Hergert has shown, a 100-page manuscript can speak louder than a 500-page book, if the writer has the nuance to pull it off. I was already thinking about how I could salvage parts of my electronic manuscript. Not everything was bad. I did still have my first two chapters on a flash drive. Chapter 2 is especially important, because it describes the two years when I was still working, but didn’t yet have a diagnosis. And because I had access to my blogposts, all 125 of them, I could have retyped any blogpost was worth with be retyped. But that would have been extremely tedious. But the savior in this saga is Paula, my wife. From the time we met in 1989, I grasped that Paula was very handy around the house. I am quite the opposite. Despite growing up in a commercial fishing family, I never got the hang of doing simple handyman tasks. But Paula has always impressed me with her handy-person skills. But when the almost fateful spilled glass of water went past the tipping point, I knew what do. I had heard other people mention that the first thing to do if you spill water on your MacBook is to flip the device and let the water drain out. And I did that immediately. What Paula did was to create a little tent from the MacBook on top of a crate and place a small fan beneath it so the precious computer files could slowly dry. We also got early to the Apple Store, so we didn’t waste time to see what the extent of the damage would be. That weekend happened to coincide with this year’s Walk to End Alzheimer’s, and many of my cohorts at the Alzheimer’s Association were on hand. It took a few days for me to really believe that this nightmare had ended with a pleasant ending.